A man is starting a journal to record events that begin only as strange and unsettling due to their repetition. 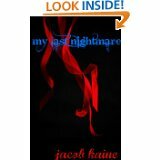 In only a short period of time the events, or attacks, fight against his mind and his sanity. He quickly spirals down into a pit of madness as the incidents escalate. Is this really happening or is it all in his mind? We follow a man as he fights against his path to destruction where only at the very end will the truth be revealed.Are all of us truly open to attacks from the dark entities of the supernatural? Or are such occurrences only a state of mind, open to interpretation? Could there be a combination of both? Can we change our destiny, or are all our paths predetermined? Follow one man’s journal to discover his ultimate fate, and maybe some answers to such questions.